What could be better than a hearty, healthy soup, fresh bread, a little wine and dinner with the family on the deck? Not much, according to Dee Gilroy, the subject of this month’s Cornelius Cooks. The UNC-Charlotte Spanish professor, husband Dave Gilroy and their four girls are an active bunch, but eating well is a family passion. “I get passionate about food and causes,” says Dee, whose real name is Diane. Her mother is famed muralist Diane Voyentzie, whose work is part of the New York City art scene. Dee, who supports Purple Heart Homes with a passion, paints life in broad strokes. Treating injured veterans is “absolutely” the right thing to do. Fighting toll lanes on I-77 is another passion: “We will fight until the end.” Indeed, she’s on the board of the Widen I-77 anti-toll group. “I love to read and travel, but more than anything I’m an activist,” she says. The Amherst grad has two master’s degrees and worked in international business before going on the faculty at UNCC almost eight years ago. 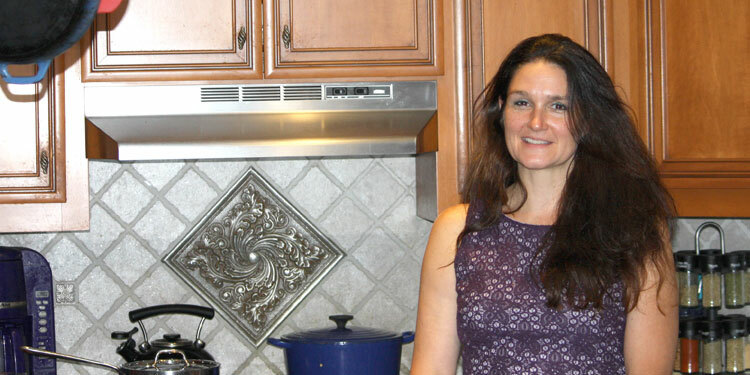 She’s traveled to 32 different countries, but raising a family in Cornelius and entertaining at home are special joys. She likes to serve a good Spanish wine from the Rioja region, or a Malbec with her five-bean soup. The fun thing about the soup is that it’s ripe for creative interpretations. Try different types of lentils, more Parmesan cheese, more kale, less kale, etc. “Be creative,” Dee says. Soak all beans and barley in a large pot of water overnight or for at least 3 hours. Empty contents of both cartons of vegetable stock in very large pot such as a Le Creuset. Heat vegetable stock until it boils. In the meantime, have beans rinsed thoroughly so that you can place immediately in pot of boiling stock. Pour beans into pot. Add 4 cups of water. Let soup mixture come to boil again. Let simmer and gradually add enough water so that mixture is not too thick. This could be up to 2 cups more. Add all desired spices to taste. This is the creative part. You can really have fun with different spices. They can be either fresh or dry. Let simmer for at least an hour. When beans are soft, add several pieces of kale for the amount of soup you will serve that same day. This kale only cooks for 10 minutes. You can add more kale for each time you reheat the soup. Top with freshly grated parmesan cheese. Enjoy! Place entire pot in refrigerator with left overs. The next day, the mixture will be extremely thick because the beans will absorb all the water. You can toss a few large spoonfuls in a bowl and microwave with enough water for your desired consistency. Also add some fresh kale and top with parmesan cheese. If you plan to serve more people. Scoop several large serving spoons into a medium sized cooking pot. Add more water to desired consistency and add salt and spices to taste. Finally, top with parmesan cheese. Enjoy!